The Nuremburg tribunal provides the precedent according to which all of today’s elite criminals – government and corporate leaders – should be judged and sentenced. It also provides a precedent for the death penalty for a corporation: In this case the chemical conglomerate IG Farben and three of its six constituent companies were dissolved, allegedly because of their participation in Nazi crimes against humanity. And yet even the unfathomable crimes of the slave labor program and death camps weren’t enough to warrant the death penalty for three of the IG Farben companies, including Bayer and BASF. These, unlike the cartel itself and the three lesser companies, were considered by the US to be too structurally important to the corporate-technocratic project. So they and their executives were given just a slap on the wrist. In fact, no corporations or corporate executives were judged according to the moral pretensions of the Tribunal, but only according to what place US elites saw for these German corporations in the post-war globalizing system. 1. If a corporation is big and powerful enough, there is no level of crime up to and including literal mass murder which it will not be allowed to commit with impunity. 2. In fact, a core purpose of the corporate form is to organize the commission of crimes against humanity and the Earth, and to provide legal impunity for the leaders of these criminal projects. 3. We the people can never look to government, which creates and exonerates these corporations in the first place, for justice or relief. If we want to be free of the corporate tyranny, as indeed we must become if humanity is to have a future at all, we must organize and carry out the anti-corporate abolition movement from the soil up. That’s the only way. Only we the people can fight back and win. The Monsanto Tribunal has rendered its verdict condemning Monsanto for crimes against humanity and the Earth. The verdict also criticizes the existing institutions of international law for their insufficiency against the great crisis we face. As the judges point out, the existing system is designed to maximize corporate power and action and gives short shrift to all other values. Implicitly the existing systems of politics and international law are designed, not to prevent and punish crimes against humanity and the Earth, but to abet them. This judgement is more profound and vast in its implications than the specific judgement against Monsanto, which is just one example of the vastly greater system of corporate organized crime and the crises caused by it. 1. Monsanto systematically attacks the health of our food, human access to food, the health and robustness of the environment, human health and well-being in general. Monsanto systematically attacks and degrades the integrity of science and freedom of scientific research and works to suppress freedom of thought and expression in general. In these ways Monsanto violates existing international human rights law. 3. The tribunal makes special note of the tremendous imbalance between law and enforcement regarding human rights, vs. the enforcement of globalization “law” where it comes to corporate “rights”, which means lawless corporate prerogative and license. The tribunal holds that corporations should be held to the same standards of international law as government, political, and military cadres who are sanctioned by human rights tribunals. In its ruling the Monsanto Tribunal has followed the premise and procedure of the 1946 Nuremburg Tribunal which dealt with similar criminals against humanity. The two tribunals conceive human rights the same way and condemn in the same way the crimes of those who assault humanity. The Monsanto Tribunal’s call to apply the rule of law to the crimes of corporations is the same as Nuremburg’s condemnation of the SS, Gestapo, and Nazi Party leadership as criminal organizations dedicated to committing crimes against humanity. This call applies even more profoundly to the very essence of a profit-seeking corporation, which is anti-human, anti-social, and a mode of organized crime in principle. This judgement is nothing new but restates the truths of natural law, the moral and biological truth known to all of us, even those who sin against these truths. (The culture of the lie endemic to technocracy proves that the technocrats know deep down they are criminals and therefore are driven to lie about their crimes. They lie to the world and most of all to themselves.) This tribunal has only restated the eternal truth. What’s lacking is the will to exercise this truth in reality. One obvious problem is that the reason Nazi leaders or cherry-picked defendants like Slobodan Milosevic or Saddam Hussein were put on trial for their crimes is that they had run afoul of the US- and corporate-dominated globalization system. But multinational corporations like Monsanto comprise the core of this system, which is dedicated to aggrandizing these criminal organizations. So there’s an obvious contradiction in calling for Monsanto’s own lawyers, bagmen, and thugs to arrest and prosecute it. The same goes for corporate rule as such. To apply law and order to the crimes of ecocide and to all crimes against humanity cannot be done within the framework of a civilization dedicated to exploitation, waste, and destruction. The laws of such a civilization and the way these laws are enforced always will follow from this underlying dedication. Even the Nuremburg Tribunal was lenient with corporate criminals and didn’t dare to ask whether particular corporations were criminal organizations. Even the break-up of the IG Farben cartel was done in a way assuring the continuation of its constituent companies including today’s agrochemical giants BASF and Bayer. The latter which currently is in the process of buying Monsanto. We see how the unfinished business of Nuremburg merges seamlessly with today’s business of the Monsanto Tribunal. 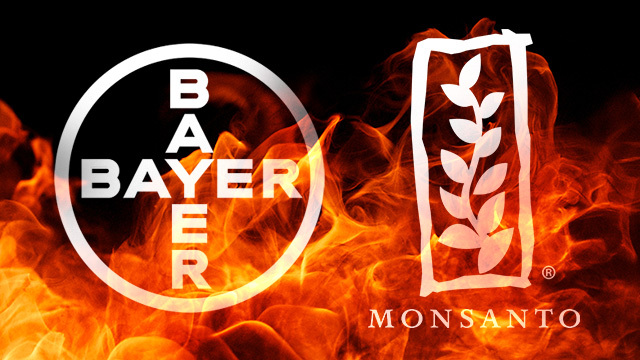 Indeed a living holdover of the Nazi era (and of the general history of chemical warfare, in which IG Farben and Bayer as well as Monsanto play a big role) is now merging with Monsanto to formalize this historical continuity. WWII never ended but only was transposed temporarily to agriculture and genetic engineering. To make the call to justice real requires the movement dedicated to realizing these truths and values. We cannot carry out the tasks of necessity and justice within the framework of a system dedicated to every anti-human and anti-ecological action and institution. We can do it only through the action of a movement dedicated to abolishing these crimes and abolishing their ideological and institutional basis. This means above all the total abolition of corporate industrial agriculture and all of its poisons. The Monsanto Tribunal, in its compilation and assessment of the evidence and the history, has only provided the latest demonstration that humanity and the Earth cannot “co-exist” with these poisons, and therefore cannot continue with a regulatory and legal model dedicated not just to this co-existence, but to co-existence on the basis of corporate profit as the great normative purpose. The Tribunal itself identifies this as the core of the crisis, even if it doesn’t draw the necessary strategic and organizational conclusions. Morally, rationally, and legally the ruling of the Monsanto Tribunal is true and follows from the ruling of the Nuremburg Tribunal. The only difference so far is the force to put the truth into effect. Only the abolition movement can muster and organize the strength and the will to realize all the necessary truths. We have to begin.